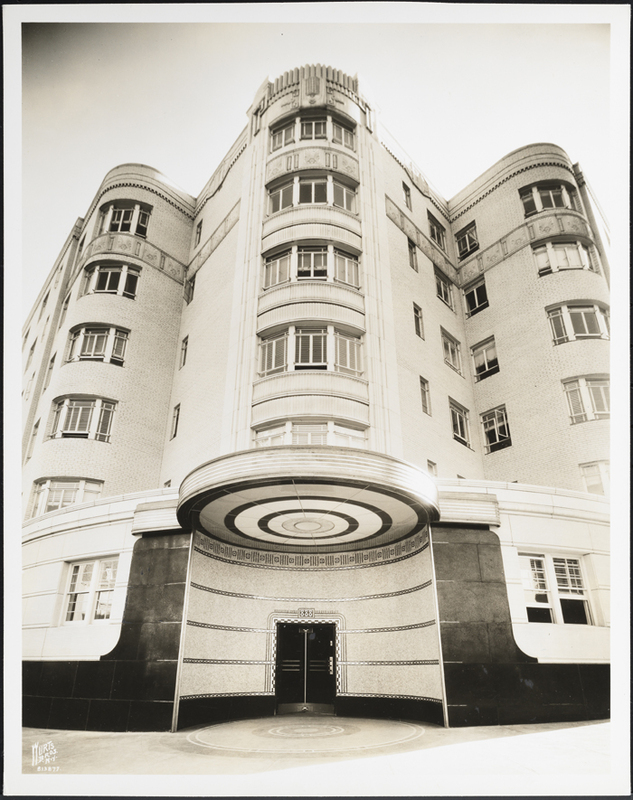 Art Deco architecture flourished in Europe and the United States during the 1920s and 1930s. 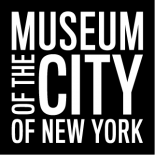 Spurred by the 1925 Paris exhibition Exposition Internationale des Arts Décoratifs et Industriels Modernes which boasted over 16 million visitors, structures such as the Chrysler Building and the Empire State Building began dotting the New York City skyline. 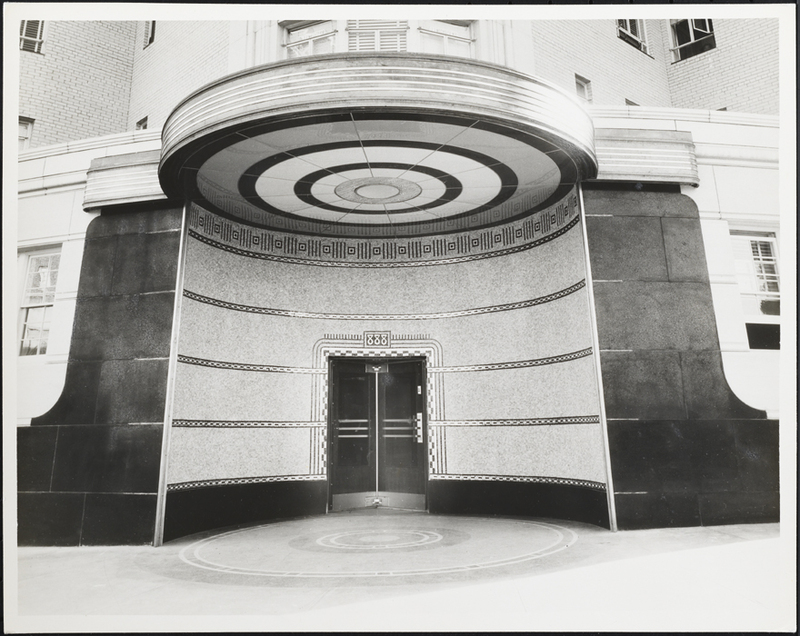 Below are some recently digitized photographs, not yet available on the Museum’s portal, that struck me as particularly beautiful in their exemplification of Art Deco architecture. 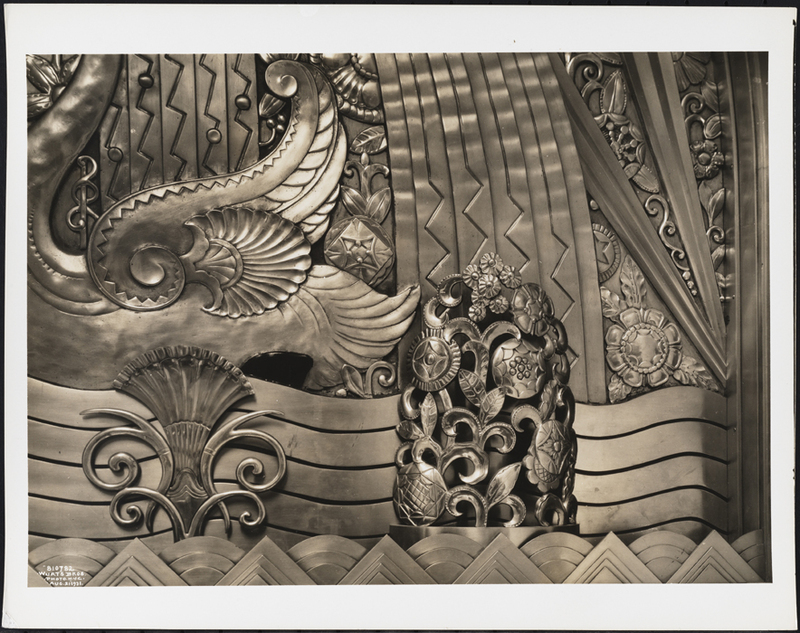 The Ziegfeld Theatre opened to audiences on February 2, 1927 with the musical comedy “Rio Rita”. The 1,638-seat theater, named in honor of impresario Florenz Ziegfeld, was financed by William Randolph Hearst and Arthur Brisbane and designed by Joseph Urban and Thomas W. Lamb. 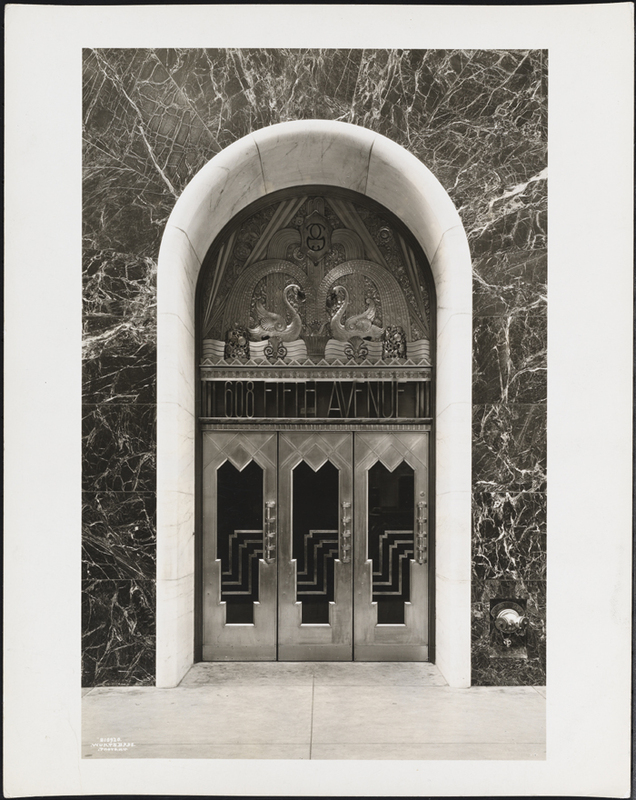 Located at the corner of Sixth Avenue and 54th Street, the theater dazzled audiences during its 38-year tenure with original productions of “Ziegfeld Follies of 1931” and “Gentlemen Prefer Blondes”, to name a few. The limestone structure was razed in 1966 to make way for an office building. 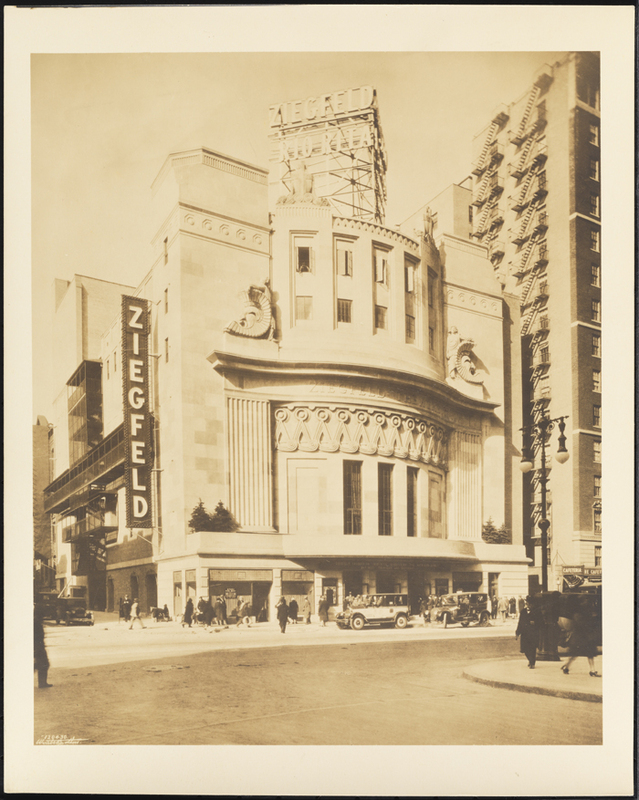 In 1969 a 1,131-seat movie palace named after the original Ziegfeld Theatre opened just a few hundred feet away. Graybar built their namesake building at the intersection of Lexington Avenue and 43rd Street from 1926-27, which served as the distribution company’s corporate headquarters until 1982 . In 2012, New York City Department of Planning (DEP) announced a proposal to rezone East Midtown, the area generally located between Second and Fifth Avenues, from 39th to 57th Streets. Some people are worried that the proposed rezoning could lead to the demolition of older buildings which are not protected by landmark status. Following the DEP’s announcement, the Municipal Art Society of New York submitted the Graybar Building as well as 16 other structures in East Midtown to the Landmarks Preservation Commission for evaluation. 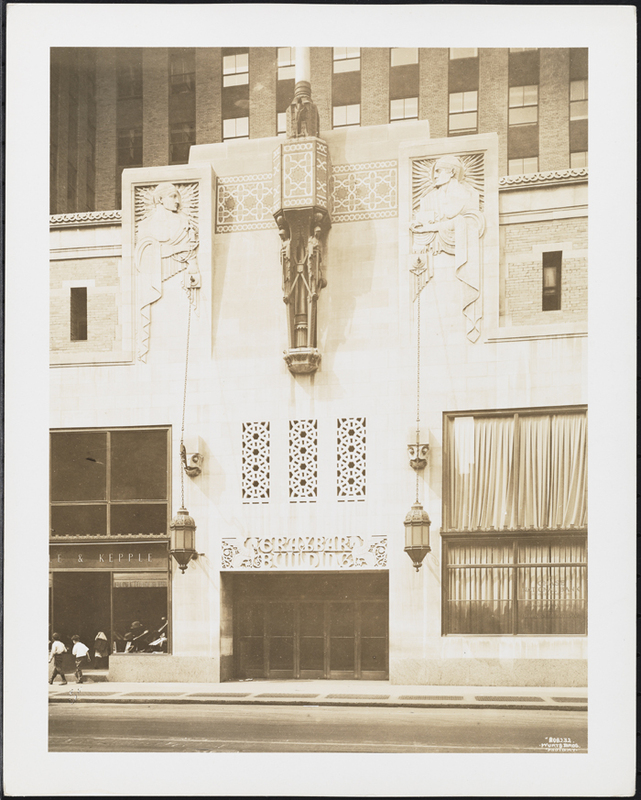 The Goelet Building, now called the Swiss Center Building, was built from 1930-32 and designed by Victor L. S. Hafner. The engineering firm E.H. Faile & Co. produced the building’s structural frame. Commissioned by Robert Goelet, the building was constructed at the intersection of Fifth Avenue and 49th Street, on land previously occupied by the Goelet family mansion. 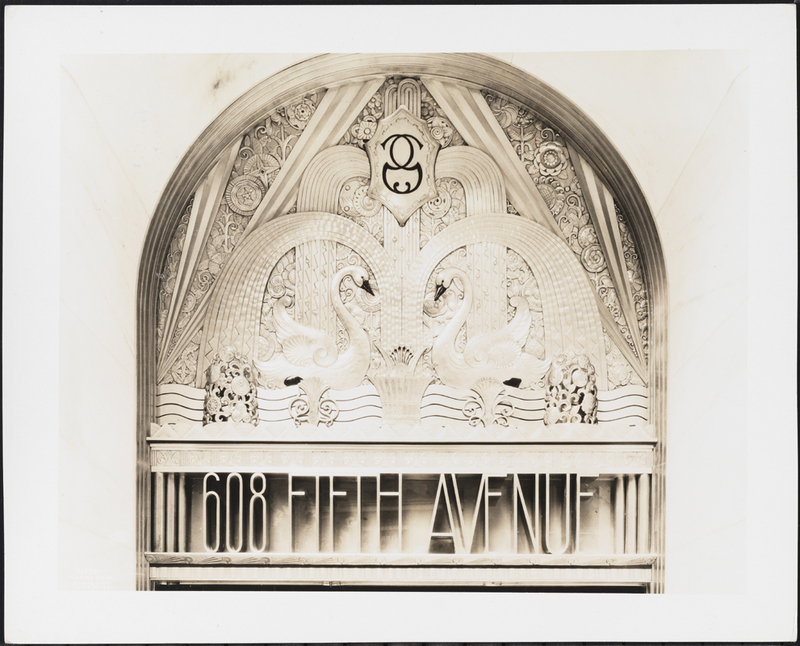 The building’s heritage was beautifully displayed on the main entrance at 608 Fifth Avenue: the cast metal tympanum, shown in the three photographs below, featured a shield with the family monogram “G” as well as the family crest, the swan. Subsequent modifications to the building in 1965 by the Swiss Center included removal of the entrance arch on Fifth Avenue. The Herman Ridder Junior High School (Public School 98) in the Crotona Park East section of the Bronx was designed by the Board of Education’s Bureau of Design and Construction and built from 1929-31 in response to the borough’s rapid increase in population during the 1920s. The concept of junior high schools, where young teenagers could transition to high school or prepare to enter the workforce, was relatively recent at that time. The junior high schools in existence were modeled after elementary school plans, albeit with some modifications. 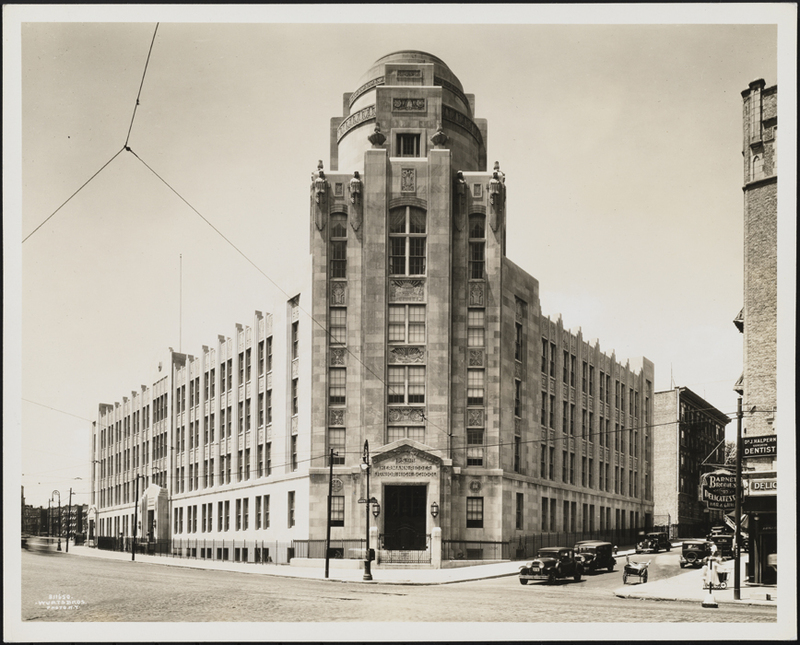 The Herman Ridder Junior High school was the first school in New York City built specifically with the needs of junior high students in mind. The Bronx had become a magnet for the middle class with upwardly mobile aspirations, an affordable alternative to pricey Manhattan real estate. The completion of the Jerome Avenue subway line in 1918 made the area more accessible and therefore, more desirable. 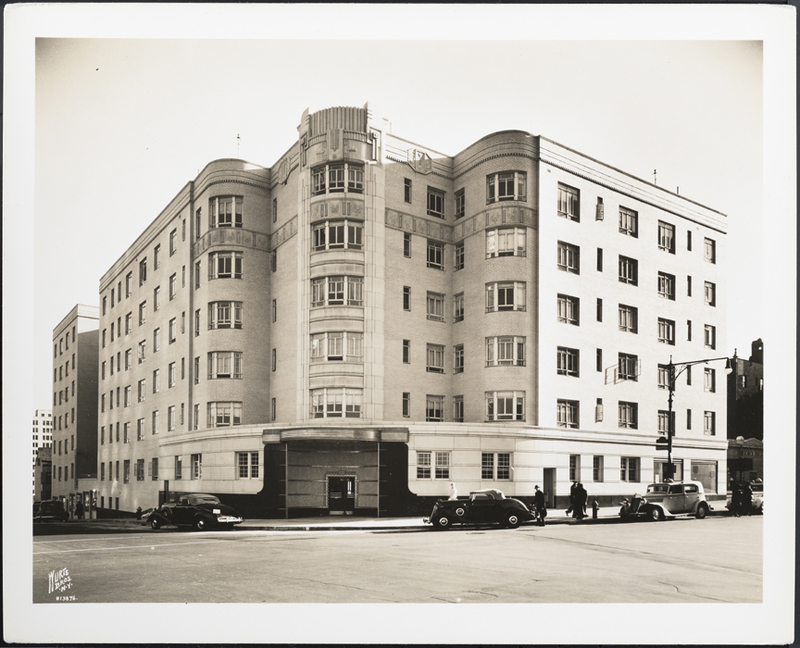 Scores of Art Deco apartment houses were being constructed during this time. The boom was particularly evident along Grand Concourse. Perhaps one of the most beautiful examples is 888 Grand Concourse, shown in the photographs below. It was designed by renowned architect Emery Roth in 1937. Digitization of the Wurts Bros. Collection was made possible by the generous funding and support of the Leon Levy Foundation. This entry was posted on April 2, 2013 by Lauren Robinson in Digital Project, Photography Collection and tagged 1920s, 1930s, 888 Grand Concourse, Art deco, Bronx, Crotona Park East, Goelet Building, Graybar Building, Herman Ridder Junior High School, Manhattan, Midtown Manhattan, Swiss Center Building, Ziegfeld Theatre.